Being a lazy tourist, I signed up for a half-day tour in Taroko National Park with Mini Voyage, the hostel I was staying at. I didn’t do any research about the national park at all, because I thought everything would be taken care of by the tour. Note that the tour was supposed to last 5 hours from 8:00AM to 1:00PM and I also expected Swallow Grotto (燕子口) and the Cave of the Water Curtain (白杨瀑布) to be included. I was lucky to have my roommate with me for the tour because we later realized that we were the only ones in the tour group (excluding the driver, of course)! She advised me to get an umbrella or raincoat as we thought we would visit Swallow Grotto where falling rocks were to be expected. 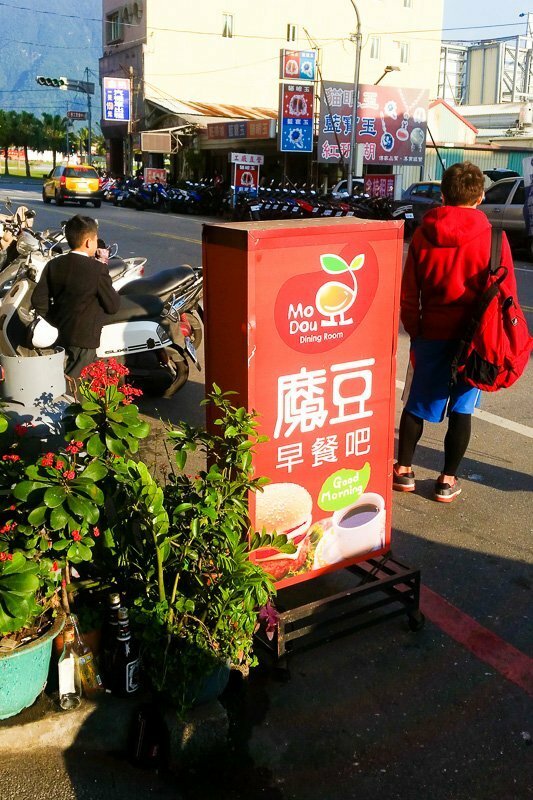 On our way out to the convenience store, the friendly staff at Mini Voyage recommended us to grab breakfast from Mo Dou, a typical Taiwanese breakfast eatery round the corner. After snagging the essentials and onigiris from Seven (the Taiwanese term for 7-11), we headed to Mo Dou to get Dan Bing and soya milk. Heading back to the hostel with our takeaway breakfast, we were informed by the staff that our ride came early and to our surprise, it was a nondescript SUV! Regardless of the shortfall in expectations, we got going and gobbled up our breakfast en route to the first destination. The food was pretty awesome by the way! It took us about 40 minutes from our hostel, which was near the train station, to one of the observatory decks of Qingshui cliff. The driver (note: not tour guide anymore) told us that it was good to be up there early since the area would be swamped with tourists in no time. While the cliff was a gorgeous view to feast on in the morning, it was hard to sustain interest in it without anyone sharing its history or interesting facts. And so, we retreated to the car after a couple of mandatory tourist shots. 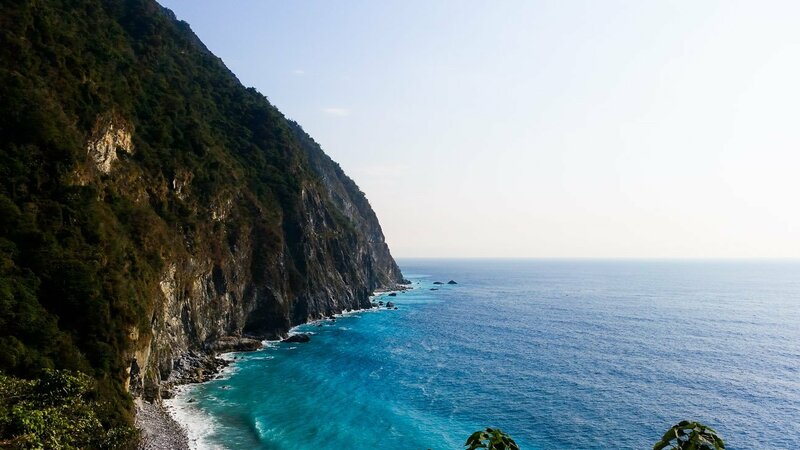 Qingshui Cliff (清水斷崖) is the only seaside viewing location in Taroko National Park where you can witness the three distinct color tones of the Pacific. The breathtaking cliff, together with the Pacific coastline and blue sky impresses every visitor. Chongde Beach (崇德礫灘) and its pebble checkerboard coast is perfectly matched with the natural mosaic of colors that paint Qingshui Cliff above. And this is why you should always do some research. The driver drove us to the visitor centre and recommended that we catch a short film there. We were the only ones in the theatre and the volunteer at the centre chatted with us a bit. He commented that the price we were paying for the ride was really cheap and we shouldn’t expect much of a service. Chuckles. The video seemed to have been filmed a decade ago, and despite the technology then, the sights captured were still awe-inspiring. BUT seriously, Skip this stopover and Use the time to cover more ground! A short drive later, we arrived at the 100 lions marbled bridge, entrance to the Shakadang trail. It is one of the more manageable trails, but Shakadang takes about four hours to cover the 8km trek. 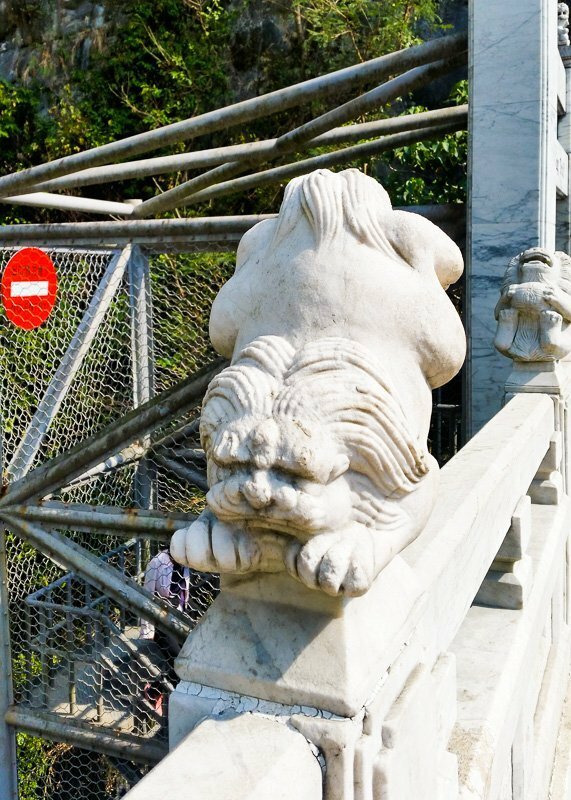 And before you descend an industrial-looking staircase to start on the trail, you’ve got to check out the marble lion sculptures on the barristers of the bridge. Every single one of the lions is striking a different pose! Deciding that we both weren’t prepared to do excessive hiking, we only visited the more accessible areas of the trail. Our driver drove us to another section of the park, the Changchun Shrine Trail and the sights got even more fascinating with the meandering streams and layers of sediments in beautiful gradients. From the bridge marking the start of the trail, it only takes 20 minutes or so to reach the first stop, Eternal Spring Shrine. 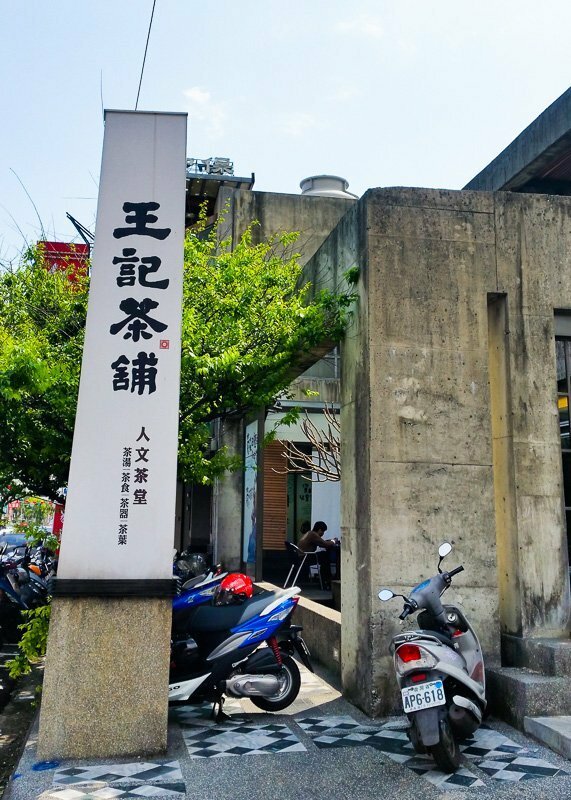 The shrine was erected to commemorate the military veterans who died during the construction of the Central Cross-Island Highway which connects the west coast to the east of Taiwan. We turned back at the shrine but beyond it, you could challenge the steps to reach Changuang temple. Alternatively, you could also start the trail from Changuang temple to avoid the uphill trek. 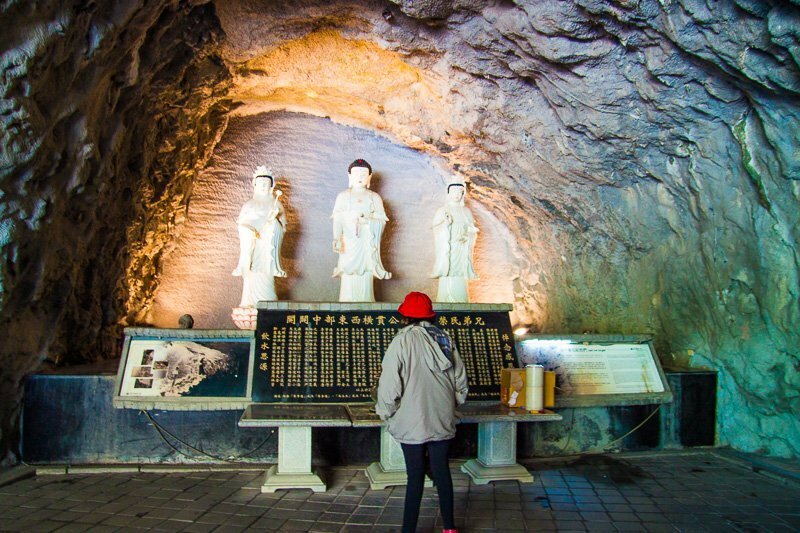 We were expecting to hit Swallow Grotto or Baiyang next but before we realized it, the driver drove us out of the national park and informed us that we would be heading to Ci Xing Tan, the last stop for the tour. Seeing that there was not much possibility to turn back, we decided not to raise our dissatisfaction then. Since it was \irrevocably\ the last stop of the tour, we decided to take our time to relax at the beach. After all, there was a good two hours before the scheduled end of the tour. 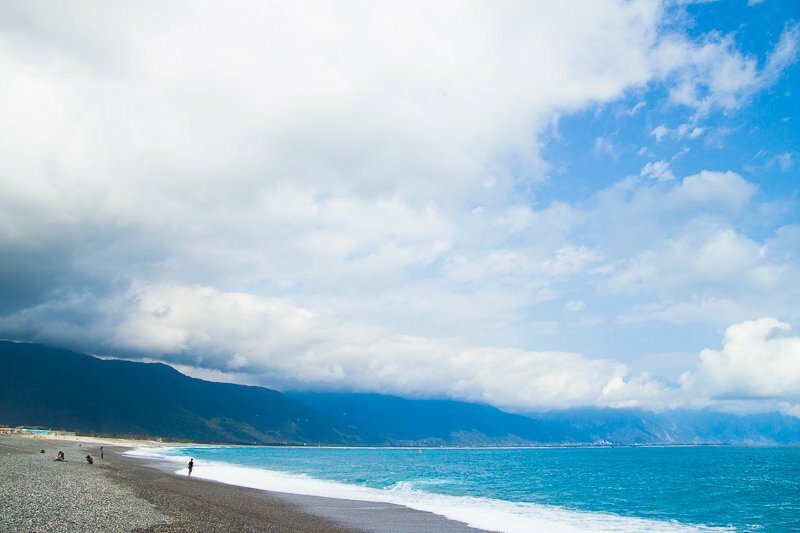 And boy, was I glad to spend my last few hours in Hualien at Ci Xing Tan. 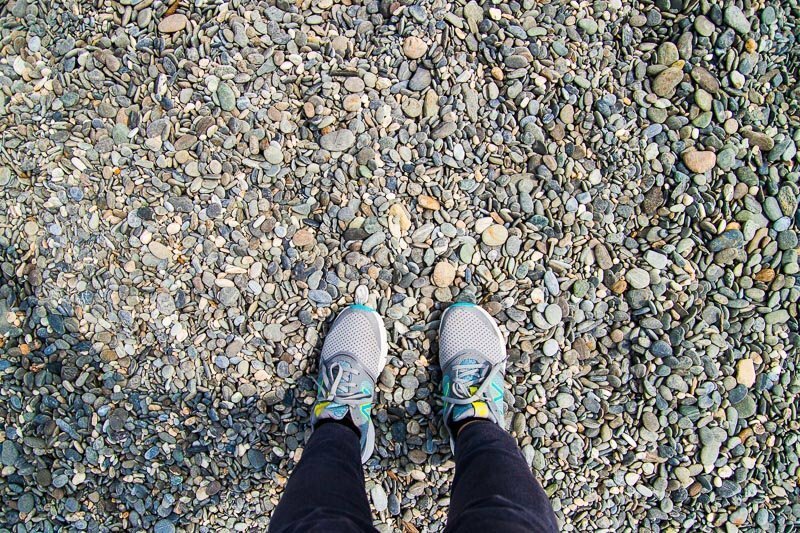 Ci Xing Tan has a gorgeous pebble beach, which wasn’t very comfortable to lie on but absolutely fascinating; some pebbles were, well, just ordinary pebbles but some were just so beautiful. I wouldn’t have imagined myself starring at rocks before this. The waters were crystal clear and had a mesmerizing blue hue. And unlike the usual beaches, this pebbled stretch hardly had any humans which kind of made it more magical. We went for a dip in the waters, even though that meant wet jeans all the way to Taipei! We arrived back at the hostel an hour before time and decided to grab lunch before my train ride at 2. We entrusted our lunch choice to the Mini Voyage staff who impressed us with his breakfast recommendation earlier. Won over by the whole apocalyptic-oriental-zen hybrid architecture, our confidence in the taste of the food was bolstered. Also helped that the price was affordable. But unfortunately, the taste was a letdown. I’ll favour instant noodles over their ramen anytime. If you are travelling alone, you might want to consider the tour recommended by your hostel/accommodation because it should be rather cheap (NT500/half day and NT700-ish/full day for mine). You may be able to avoid getting shortchanged like us by confirming the tour itinerary with the driver on the way to the first location. We both checked the rough itinerary with the hostel and that didn’t turn out too well. Also, check with the driver the amount of time you have at each place or if you are able to discuss with the rest in the tour, work out a refined itinerary with only the places you want to visit. While I was upset that we didn’t manage to visit Swallow Grotto and Baiyang trail, it was understandable that NT1000 for the two of us was hardly justifiable for driver to include more places; it might work out better if you take the initiative to skip some stops. 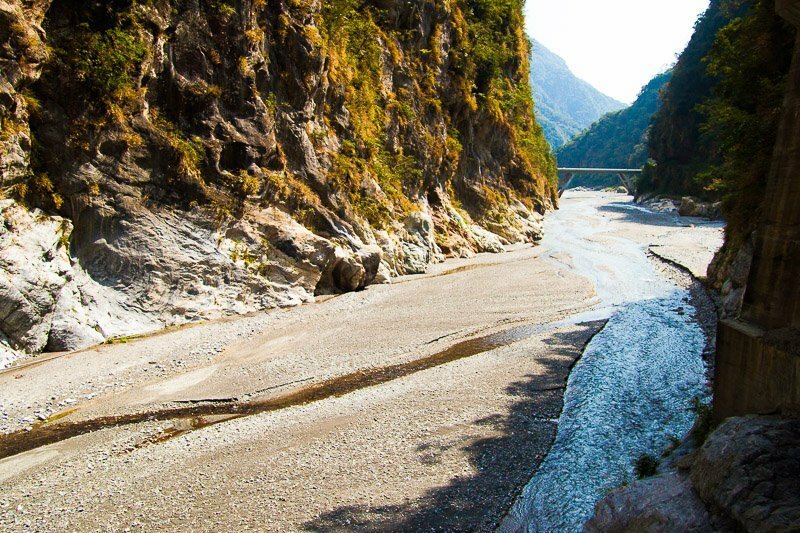 If you are visiting Taroko National Park in a group, I’d suggest you to rent a cab. The standard yellow cabs will seat four (or more if there are children probably). The rates, from what I understand, are about NT2500 to 3500 for a half to full day booking. However, please do, do, do research beforehand and factor in the time for trails. I highly recommend that you choose at least one trail to complete! You can plan a rough itinerary with the places you want to visit with the estimated duration at each stop and discuss with the driver beforehand. Taiwanese drivers will usually make suggestions but are more than willing to accommodate reasonable plans! 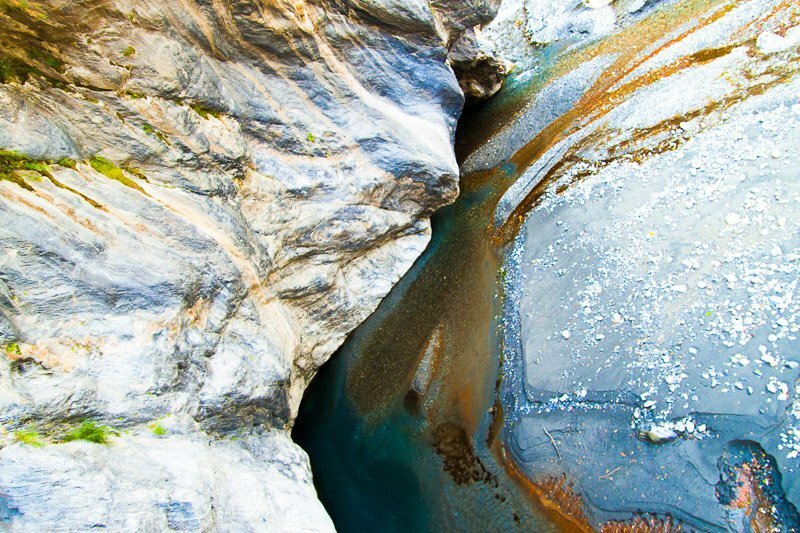 Map of the Taroko National Park with all the sightseeing spots and trails singled out to help you conquer them all! I chose the 3-pax female form and was lucky enough to meet two friendly Asian ladies. They only have a mini locker (somewhat the size of those at our sports complex) that’s sufficient only for your valuables. We just kept our luggages near us, locked. Hello, I accidentally found your blog when I was searching for info for my Taiwan trip. Definitely lots of great info here. Keep up the good work! hi how did you find the service of the cab driver? can recommend me his hp number? thank you. Amazing trip! 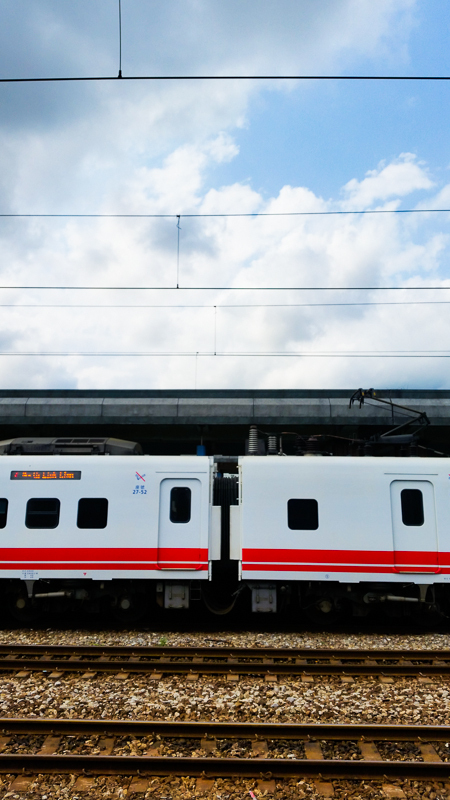 By the way, how long was the train ride you had from Taipei to Hualien? sorry for the late reply. I booked the tour with the hostel, Mini Voyage.